Alex and I haven't really been out much since we moved to Denver. He's been working really hard and the first trimester had me exhausted. Most nights I was in my pajamas by 8 o'clock. Plus, we have been taking advantage of every spare moment to fix up our house (pictures soon, I promise!). But last Friday night Alex whisked me away to a fun dinner downtown. We went to Bistro Vendome. It's a cute little French restaurant in Larimer Square. We decided to be a little adventurous and try the frog legs as an appetizer. I had my doubts at first, but they were absolutely delicious! I don't know what spices they used, but they were so tender and juicy and the sauce it came with added a little bit of sweetness. It was perfect. 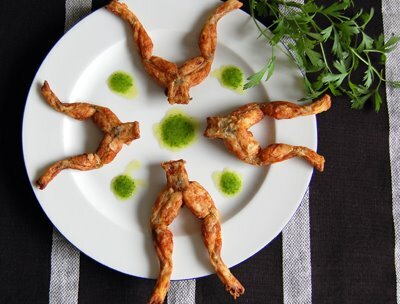 I just wanted to encourage you, if you've never had frog legs before, give it a try. And let me know what you think!